The other day my Dad gave me some more rhubarb from his garden and I decided to make a gluten-free rhubarb and ginger crumble with it. 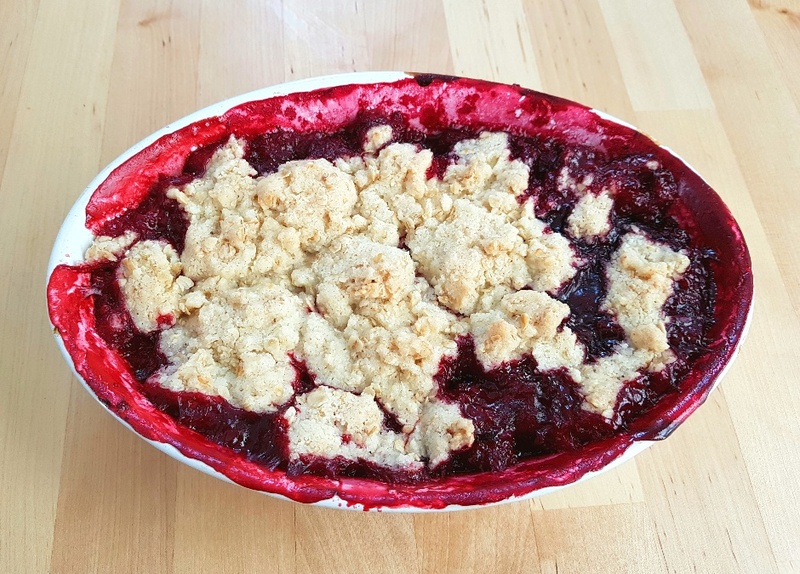 I wasn’t going to write up this recipe because I was convinced that I must have put a crumble recipe up on my website at some point in the past, but I was astonished to find out that I hadn’t. I make crumbles all the time because they’re such an easy, quick pudding to knock up and they’re a great way of using up old fruit that’s kicking around the fruit bowl. A while ago I’d been in Morrison’s supermarket and I spied a huge bag of fresh ginger roots in their ‘Selected Seconds’ section for the incredibly low price of 62p and because I normally use fresh ginger in my curries I figured that I’d chuck the roots in my freezer and use them as and when I needed them. 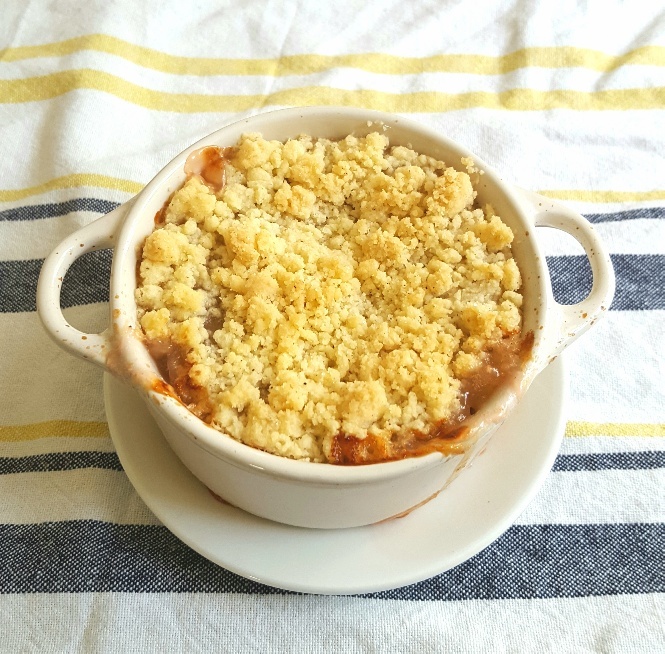 However, when I was considering what to pair my sticks of rhubarb with I remembered that I had the fresh ginger and so I decided that a rhubarb and ginger crumble would be a beautiful combo. I’ve written before about how dry and granular gluten-free flour tends to be, but in this case it’s a real bonus because it lends itself very well to giving the crumble topping a really crisp, biscuity texture. 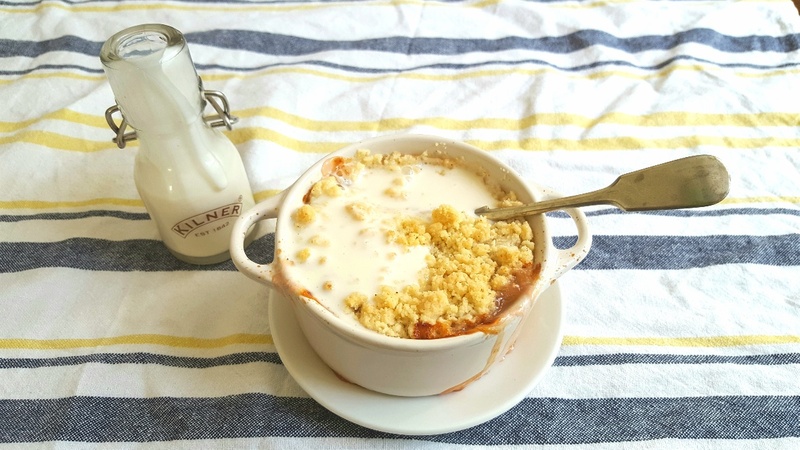 As a result, the rhubarb and ginger crumble you take out of the oven has a crunchy, buttery topping that provides a delicious contrast to the sharp, but sweet pulped rhubarb that’s thoroughly infused with the warmth of fresh ginger. It’s a dessert which marries perfectly with a generous dollop of custard, a scoop of cold ice cream or a gulg of cold cream. Place the rhubarb pieces, minced ginger and sugar in a large saucepan over a medium heat and cook until the rhubarb has pulped down. Meanwhile, preheat the oven to 200ºC/180ºC/400ºF/gas mark 6. Put all of the dry crumble ingredients into a large mixing bowl and rub the butter into it until it looks like damp sand. Once the rhubarb has cooked, taste it and add more sugar if you like before pouring it into an ovenproof casserole dish. Scatter the crumble mixture over the top and bake until the top is golden brown. Serve with cream (I like oat cream), ice cream or custard.